CARFAX 1-Owner. FUEL EFFICIENT 22 MPG Hwy/16 MPG City! XL trim. 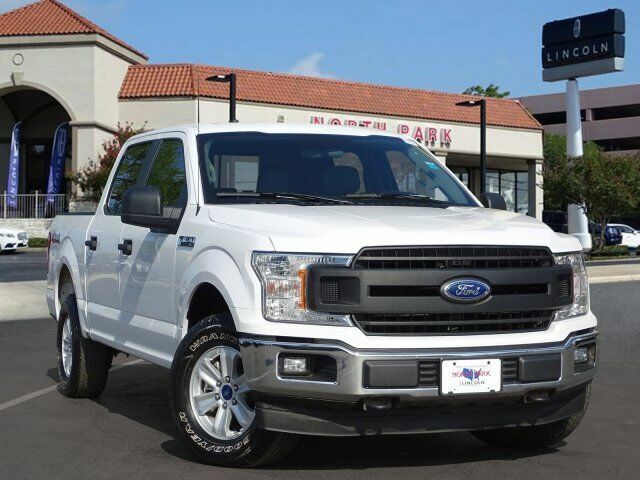 ELECTRONIC LOCKING W/3.55 AXLE RATIO, 4x4, Back-Up Camera, MEDIUM EARTH GRAY, VINYL 40/20/40 FRO... EQUIPMENT GROUP 101A MID, TRANSMISSION: ELECTRONIC 10-SPEED AUT... ENGINE: 5.0L V8. CLICK ME! EQUIPMENT GROUP 101A MID SYNC, enhanced voice recognition communications and entertainment system, 911 assist, 4.2 LCD display in center stack, Applink and 1 smart charging USB port, 4.2 Productivity Screen in Instrument Cluster, compass, XL Power Equipment Group, Power Glass Sideview Mirrors w/Black Skull Caps, manual-folding, Power Door Locks, flip key and integrated key transmitter keyless-entry (includes Autolock), Illuminated Entry, Power Front & Rear Windows, Perimeter Alarm, Power Tailgate Lock, MyKey, Radio: AM/FM Stereo/Single-CD Player, 6 speakers, Cruise Control, ENGINE: 5.0L V8 auto start-stop technology and flex-fuel capability, 3.31 Axle Ratio, GVWR: 7,000 lbs Payload Package, ELECTRONIC LOCKING W/3.55 AXLE RATIO, TRANSMISSION: ELECTRONIC 10-SPEED AUTOMATIC selectable drive modes: normal/tow-haul/snow-wet/EcoSelect/sport, MEDIUM EARTH GRAY, VINYL 40/20/40 FRONT SEAT. Ford XL with Oxford White exterior and Medium Earth Gray interior features a 8 Cylinder Engine with 290 HP at 6500 RPM*. The brake pedal feels reassuringly firm and easy to modulate in everyday driving, and the brakes feel just as capable when the bed is loaded with cargo. -Edmunds.com. Great Gas Mileage: 22 MPG Hwy.